A stunning mastering EQ that only suffers slightly from the limitations of its overly authentic control emulation. Excellent mastering EQ. Brings excitement to the presence range. Silky, airy top-end. Unnecessary Out setting on the Frequency selector knobs. Developed by Softube, Curve Bender is a plugin emulation (VST/AU/AAX/RTAS) of Chandler's rebuild of the classic EMI TG12345 stereo passive console EQ for UAD-2/Apollo, designed for mastering but also viable for mixing situations. Its two channels are linked by default, but can be unlinked to work in dual mono mode, and, as a software-exclusive addition, there's also a Mid/Side mode, with the left-hand controls processing the mid signal and the right-hand controls working on the side. Annoyingly, switching from Stereo to M/S mode (and back) doesn't automatically unlink (and relink) the two channels - you have to hit the Link button as well. Curve Bender is a four-band semi-parametric EQ with additional Low and High Pass Filters (each offering a choice of 11 cutoff frequencies), and shelf and bell options on the Low and High bands. 'Semi-parametric' refers to the lack of discrete Q control, although each frequency band includes a Multiply switch for extending the cut/boost gain range from +/-5dB to +/-7.5dB that also kicks in a narrower Q when engaged. The Frequency and Gain controls are all stepped, the former having eight centre frequencies per band (except Low, which has seven), and the latter ten steps (in 0.5 or 0.75dB increments, depending on the setting of the Multiply switch). Bypassing a band is done by setting its Frequency selector knob or Multiply switch to Out. The second is by far the easiest of the two, and makes us wonder why they didn't ditch the other one for the plugin. Designed for the broad brushstroke tonal adjustments of the mastering engineer, not surgical EQ work, the original Curve Bender hardware is known for its 'mojo' rather than its precision, and the plugin captures that perfectly, its passive design enabling mid and high bands to be boosted without introducing the creeping abrasive distortion associated with active EQs. A Presence boost in the x1 Gain range (ie, with the broader Q) jumps the track out at you in a perky yet still very smooth way; while a top-end shelving boost brings a glossy professional sheen to the mix with no hint of edginess. The lower bands aren't quite as impressive, introducing little discernible richness or character, but are still useful for adding weight or broad scooping of the lower mids. Curve Bender combines the broad tonal control of a self-assured mastering EQ with an attractive character that always seems to effortlessly resonate with the music being processed. Much like the old Neve EQs, a mix just has to be touched by it to sound better. 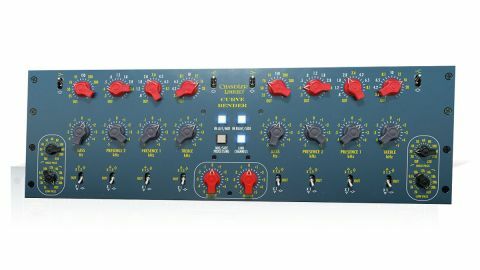 The M/S facility and extended gain range with dual Q settings broaden its appeal to the mastering fraternity, and overall it unarguably deserves a place at the top table of mastering EQs.